Three act structure is a form of plot found very commonly in film, but which can be used in just about every kind of story. As the name suggests, it consists of three parts: The Setup, the Confrontation, and the Resolution. Disc one is the the Setup. We are introduced to ex-SOLDIER Cloud Stryfe, mercenary and former guard for the ruthless and world-controlling Shinra Electric Power Company, and Avalanche, the small band of eco-terrorists fighting against them. We meet them in Midgar, Shinra’s grimy, dystopian capital city, built in such a way that the poor are denied even sunlight. The first act contains the Inciting Incident, the event in the story which changes the direction of the characters. In Final Fantasy VII, this is the murder of President Shinra. As the head of Shinra corporation, he serves as the main antagonist for Cloud and the others. They break into Shinra headquarters to confront him, only to discover he has already been killed by Sephiroth, a powerful SOLDIER thought to be dead. Sephiroth’s appearance as antagonist, and Shinra’s death, the trajectory of the story changes. Cloud and party escape the confines of the City of Midgar and follow Sephiroth’s trail across the expanse of the world, while they are pursued by the Turks, Shinra’s elite unit of special forces. The first act ends with a plot point that again changes the direction of the story and propels the action into plot two. In Final Fantasy VII, this is of course another confrontation with Sephiroth and another murder. This is the infamous death of Aeris, a healer with an ancient lineage who may hold the key to stopping Sephiroth. Depending on the player, she is also probably Cloud’s primary love interest at this point. Aeris’s murder serves a dual purpose in the story. It is a setback which removes a potential solution to Sephiroth’s mysterious goals. It also raises the stakes by killing a party member and Cloud’s love interest, assuming the player chose her through his actions. This elevates the journey to find Sephiroth from a search for answers to one of revenge. Next time, we’ll look at disc two, and discuss Rising Action as Sephiroth’s plan is put into motion, and Cloud comes face to face with who he really is. If you enjoyed this article, please share it! Or, support my Patreon for more content! Previously on “The Gamer’s Guide to Writing,” we looked at the title screen animation and character portraits of Final Fantasy IX. Today, we’re pushing start and getting into the game itself with two contrasting views of Alexandria, and a heist about to unfold. As ever, spoilers ahead. Like many games of its cycle, Final Fantasy IX begins with a video cutscene. Much like the opening scene of a film, credits are superimposed above the action. We start with a little boat in a storm. Two figures struggle to keep afloat as waves toss and spin the vessel. The camera zooms in on one of the figures, a small girl, and then the scene abruptly changes to Princess Garnet, who has fallen asleep in a chair. She goes to an open window, and we pan to a wide shot of the Kingdom of Alexandria as white birds fly over the city in the light of a setting sun. The camera follows the birds as they fly towards a massive airship. It focuses on shots of the figurehead, a mermaid, and the propellers, which appear as stylized towers, before giving an establishing shot of the entire vessel. This is the Prima Vista. Onboard the ship, the camera follows Zidane down a ladder and through a door, then puts the player in control. Zidane is there for a meeting of Tantalus, a group of thieves posing as a theatrical troupe. As the gang gathers to plan their upcoming heist, they are suddenly attacked by a dragon-headed figure, who turns out to be Tantalus’s leader Baku in a costume. After Baku cries uncle, the five thieves meet in a side room to go over the plan. Tantalus is traveling to Alexandria ostensibly to perform the popular play “I want to be Your Canary” for Queen Brahne and Princess Garnet. Their real objective is to kidnap the princess while everyone in the castle is distracted by the performance. This establishing scene does a lot of good work world-building and establishing plot. It also establishes gameplay, letting the player interact a bit with the environment, explore, and fight a brief battle. The important thing about this scene is that it uses a light touch. It is mostly exposition-free. We don’t get a monologue about Baku’s long friendship with King Cid, or Alexandria and Lindblum’s long history. We get exactly what we need to know that a heist is about to go down, and Zidane is a major part of it. There is another cutscene of someone watching the airship dock at Alexandria castle. As the airship glides majestically over the city to the castle, we see it reflected in a huge, mirrored crystal that stands atop the castle, and the credits end with the logo for Final Fantasy IX. Now, we’re following the little black mage Vivi. If we previously got a birds-eye view, now we are on the ground with Vivi as he attempts to wind his way through the huge city. He somehow has a ticket to the performance, but is clearly overwhelmed by Alexandria. He makes his way to the ticket booth, interacting with street urchins and working-class Alexandrians as he goes. He even has the opportunity to play a few mini-games. When he gets to the castle, though, he discovers his ticket is a fake! If he wants to see the show, he’ll have to find another way in to the castle. That’s when Vivi meets Puck, a rat-faced street urchin that can get him in, as long as he promises to be his slave. Vivi, who is completely lacking in street wisdom, agrees, and the pair steal a ladder to make a daring rooftop entrance to the castle. They sneak inside just as the play is about to start. Vivi’s journey through Alexandria is first-rate game storytelling. The player doesn’t get to fight anything, but there is plenty to explore, and doing so in the shoes of earnest and inexperienced Vivi is an excellent method. As with the Prima Vista, we get dialog that serves both as world-building and character development as he makes his way through the Victorian city. While the game is not quite so stark as Dickens’ London, we are introduced to a world of struggling shop owners, harried housekeepers, and thieving orphans, even if most of them are willing to stop and play a game of cards. While the opening cutscene focused largely on the grandeur and majesty of the world, with a fantastic castle and a high-flying airship, the game contrasts this by starting off in a cramped cabin and following some of the least powerful Alexandrians. This contrast between Nobility and the Working Class, between white marble and sooty cobblestones, is a theme that is established early and continues through the rest of the game in a variety of ways. Next time: Tantalus puts on a play and the line between the actors and the audience blurs when their kidnapping heist doesn’t go as planned! Be sure to visit my Tumblr page for video and screenshots! Welcome back to The Gamer’s Guide to Writing! Last week, we introduced the game Final Fantasy IX and talked a bit about where it fits into the franchise of the series. Let’s start up the game and have a look, shall we? The first thing that appears on the screen are logos for the publishers and developers. But the Squaresoft logo fades in to a short cinematic, while soft, medieval-sounding flute music plays. This is the audience’s first real look at the style and tone of the game, and FFIX goes for an epic tone out of the gate. We see images of a vast city, its sky teeming with airships, grand castles, and sweeping landscapes, all superimposed with a map detailing their locations. 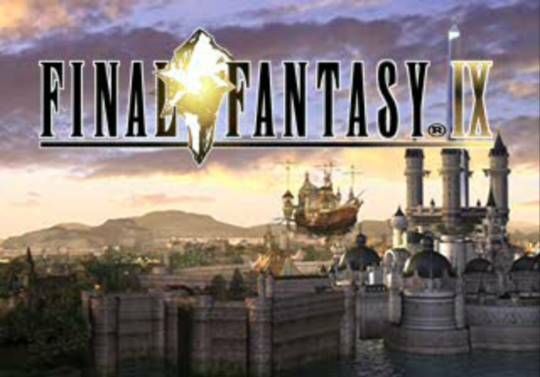 The screen finally crossfades to the title screen, with the Final Fantasy IX logo over the background of a glowing crystal. The thing I find interesting is that nowhere in the clip do we see a character, or get any close ups of a human figure at all. This is the setting and art on display. It is a promise of a wide scope, of a game that stretches across global proportions. This is a promise of where you’ll be going. But if we leave the controller alone for a moment, something else happens. If left to run by itself, the game will run through a series of still images of the protagonists. Each of the eight playable characters appears in close up, with a single word description above them and a line of text below. Nowhere in each picture do we find the character’s name, but each is an efficient little description of who each one is, and what their motivations are in the story. Each of these is a still shot from a FMV cutscene. For instance, Zidane, the main character, is an image of him with a horrified expression standing against a bank of dark storm clouds. 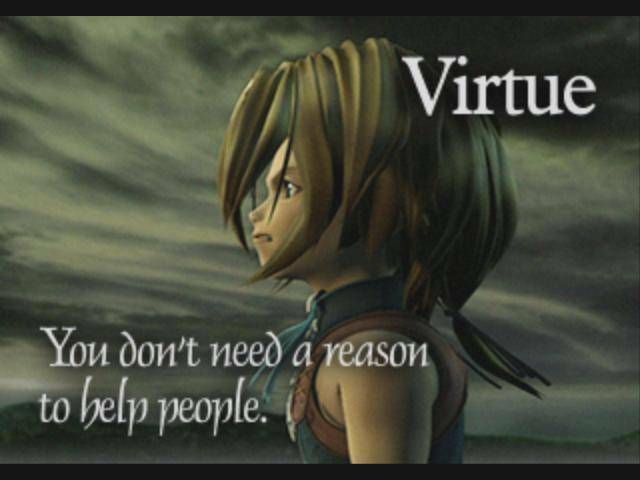 It reads “Virtue” at the top and “You don’t need a reason to help people.” In this single frame, the game tells us that this is the hero of the game. He’s a good guy, and he is motivated by a strong sense of justice. Now, this isn’t all there is to the character, of course. This is especially true of some of his actions during disc one, but when it comes down to brass tacks, he isn’t motivated by greed or status. He is motivated out of a desire to do good. Vivi, on the other hand, is motivated very differently. The text on his image reads “Despair,” and the line underneath says, “How do you know you exist? Maybe we don’t exist…” While Quina’s states “I do what I want! You have problem?” This shows the reader that Vivi’s motives stem from his need to understand and establish his own identity, while Quina’s actions stem from their own simple desires. But what purpose does putting the movie and character portraits serve? Much like the text and quotes on a dust jacket, they are there to sell the product. If you went into a game store in 2000, you might have seen a monitor on the counter with the opening to Final Fantasy IX playing in a loop. Prospective players could watch and get an idea of what the story of the game was like, without being spoiled by it. This little opening section is an excellent example for writers coming up with description copy for their books. Whether you go epic, or personal with your characters, your goal is to present your story as evocatively as possible in the fewest words. And notice that none of them have to necessarily be your characters’ names! This could also be an excellent character building exercise. Think about the protagonist of your work in progress. What is one word to describe them? Can you summarize their motivations in a single line? Next week, we’ll press start and explore Alexandria from the point of view of a little Black Mage in a big city! For more screen shots and examples of this week’s topic, be sure to visit my Tumblr page! And if you enjoy the articles, why not chip in on Patreon? Like many genre writers, I enjoy playing video games, and I often complain that my gaming addiction is taking time away from my writing, and vice-versa. But I’ve found that in some ways, my love of gaming has had a great impact on my writing. Even in a genre that is generally panned for its presentation of script and plot, an observant writer can still pick up pointers about what to do, and what to avoid. This blog is a look at some of the lessons I’ve picked up in my many years behind a game pad. 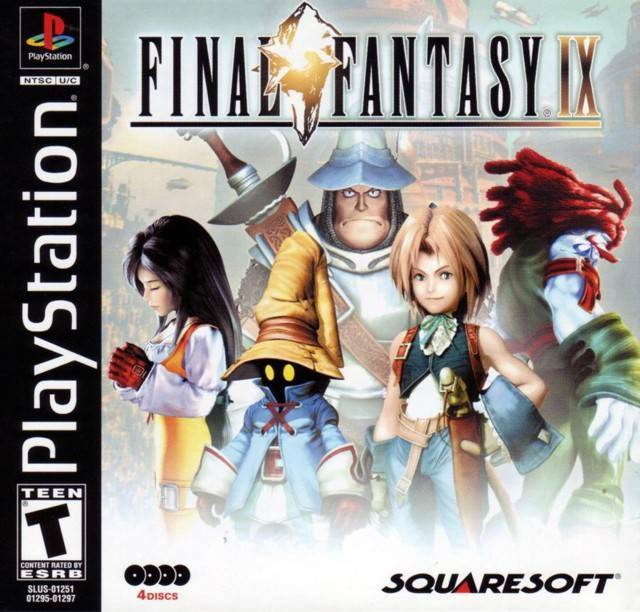 A game I’d like to look at first is “Final Fantasy IX.” Launched in the U.S. in November of 2000, it is often overlooked because of the timing of its release. It came out at the tail end of the Sony Playstation’s lifecycle, a full month after the blockbusting premier of the Playstation 2. Even though the game pushed the console to its limits, it was competing against more dazzling technology. It also has an awkward place in the franchise, between the panned “Final Fantasy VIII” the next year’s revolutionary “Final Fantasy X” for the PS2. None the less, FFIX is an excellent source for writers looking at plot, structure, character, and theme. Over the next series of posts, I’ll be drilling deep into the plot of the game, examining the presentation and hunting for literary gold, as Dave Robision would say. Think of this like a very different sort of walkthrough. Instead of looking for secrets to success in the game, I’ll be looking for hints to improve writing craft. Spoilers obviously will be a part of this project. So if you have an old set of discs gathering dust, or a few bucks of Playstation Network credit lying around, come join me as we examine how a classic game tells a great story. Next week, we’ll look at compact character introductions, and what we can learn from the title screen! Final Fantasy IX was originally released for the Sony Playstation and is also available as a digital download on Playstation Network.